Stems erect or diffuse from a perennial root, 5 to 20 inches high, finely canescent and becoming branched. Leaves nearly sessile, linear-oblong to oblanceolate, one-half to 1 ½ inches long, one-third of an inch wide or less, green above, canescent beneath. 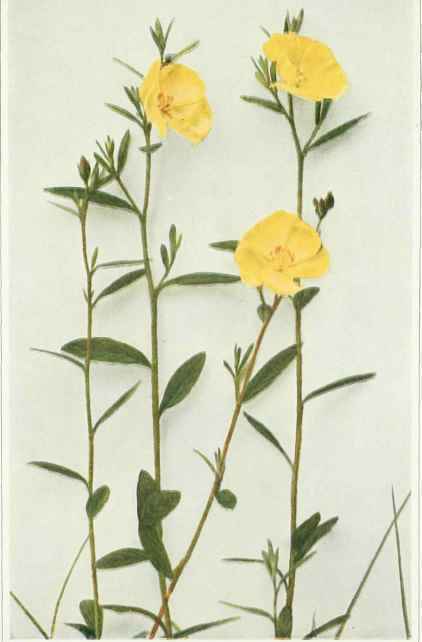 Flowers bright yellow, usually one or two, 1 to 1 ½ inches broad; sepals five, the two outer ones much smaller; petals five, broadly obovate, soon withering and falling; capsule ovoid, about one-third of an inch long. After the petaliferous flowers fade and fall, the axillary branches elongate and bear numerous apetalous sessile flowers, which develop fruiting capsules about one-sixth of an inch in diameter. In sandy fields or rocky soil, Maine to Ontario and Wisconsin, south to North Carolina and Mississippi. Flowering from May to July. A closely related species of similar situations, Crocanthemummajus (Linnaeus) Britton, is more canescent, the primary flowers clustered at the summit of the stem and not surpassed by the branches; the secondary or apetalous flowers very small and producing capsules which are only about one-twelfth of an inch in diameter.